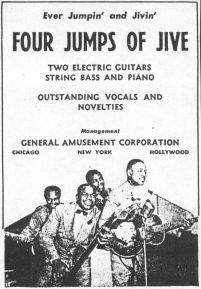 Above Left: Promtional clipping for Four Jumps Of Jive (L-R) Ellis Hunter (guitar), Willie Dixon (bass), Gene "Jimmy" Gilmore (piano), and Bernardo Dennis (guitar). Dixon and Gilmore had been with The Five Breezes (recording in 1940). Dixon and Dennis would later form The Big Three Trio (recording in 1947-52). Above Right: Label image for Mercury 2001A recorded on 10/12/45 in Chicago and released in 1945. This is Mercury's very first record. 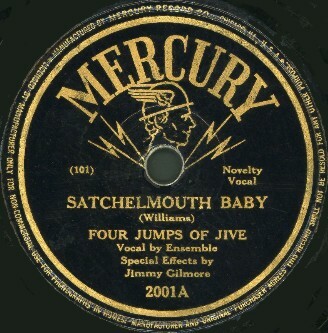 The Four Jumps Of Jive had one more release on Mercury, also in 1945. All four sides are from the same recording session.